This is my favorite picture from our daughter’s wedding. Puzzled? Mmmm I understand. 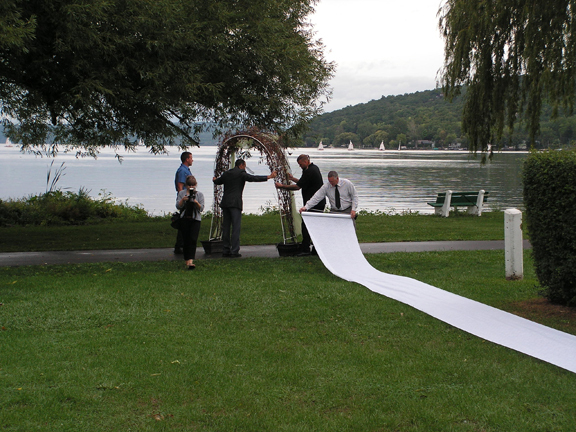 No bride and groom, no artsy flowers and rings image, no hint of any nuptial activity at all. 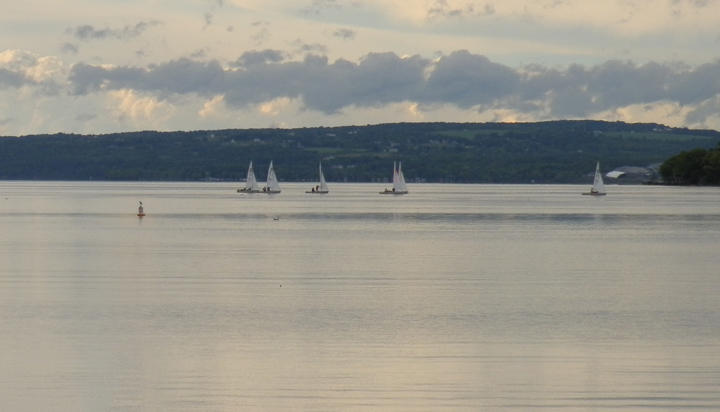 There are however sailboats on the lake. Look closely. There is of course a story to go with it. 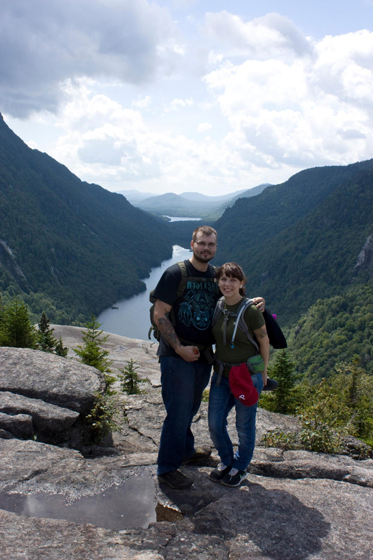 The kids at Indian Head Lookout Adirondack Park, NY just after Joe proposed to Kara. Having an indoor location is an requirement if one is planning an outdoor wedding in Upstate New York, regardless of the time of year. People who hold outdoor events inevitably rent one ( or more ) of those big white tents, with sides (plastic “windows” optional). As this story unfolds, it will be clear a tent would have been a major mistake. 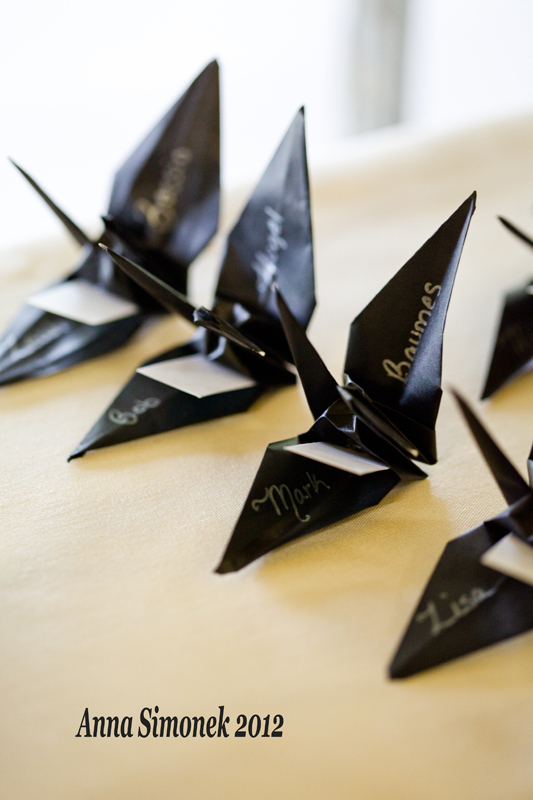 The day before the wedding, we arrived in Ithaca with two truck loads of boxes containing everything from paper cranes to paper lanterns. Shortly after our arrival, my husband received a call on his cell phone from the parks department. “Yes, yes we have an outdoor event planned….” I hear him say, ” Mmmm yes, we have heard that is a possibility…ok…yes we do have shelter in the area….ok… well thank you for calling to let us know.” My husband says the parks department called to inform us of a severe weather alert, bands of heavy rain, possible hail, high winds, including a tornado watch, for tomorrow afternoon. He was not telling me anything I did not know already. There was a reason I brought my radio with the NOAA weather band along on this adventure. I had been carefully monitoring the weather reports for over a week. By “weather reports” I do not mean the typical forecasts from our local meteorologists. Being an avid hiker and birder I learned quite awhile ago how to decipher NOAA’s radio and on line weather reports. I never travel without my weather radio. 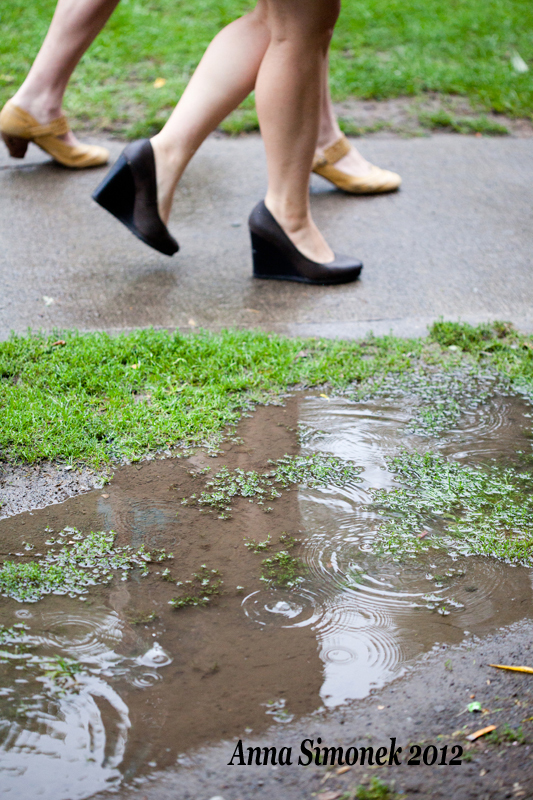 What I knew at the moment of that phone call was the worst of the weather would hit midday and was expected to “blow through” by mid-late afternoon. The key was how “late”, since the wedding was scheduled for 4pm. Somehow I knew it was more than mere words. Somewhere deep inside my soul I knew beyond any doubt, regardless of any facts or weather reports, everything was going to be all right. I held on tight to that belief and drove to the closest hardware store where I bought every handheld flashlight they had; I have faith but I am a realist. 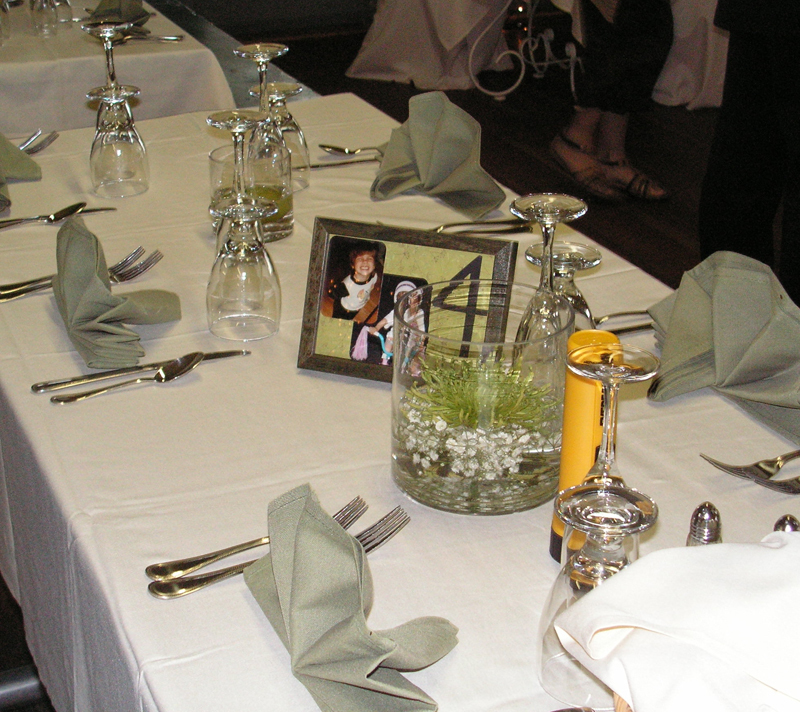 They made for an interesting addition to the table decor. 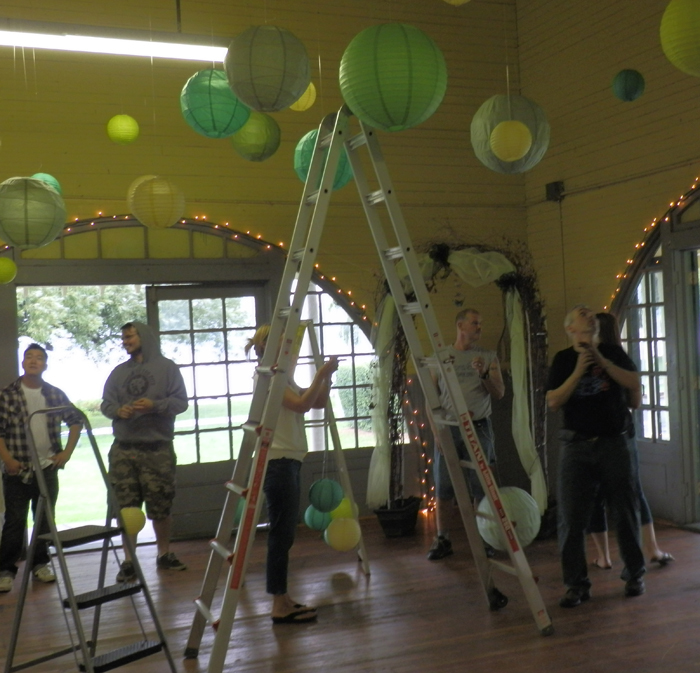 My husband and Joe’s dad along with a small army of helpful friends and relatives worked til nearly midnight transforming a humble rustic building into a beautiful venue. The next morning, our caters from Ithaca Bakery and Cafe ( they deserve a plug http://ithacabakery.com/ ) worked true magic making plain green picnic tables into elegant banquet seating. When the lights and lanterns were hung, the candles lit, delicate flowers floated in water, wow! even the emergency flashlights looked wonderful. Then at midday, the storm hit. 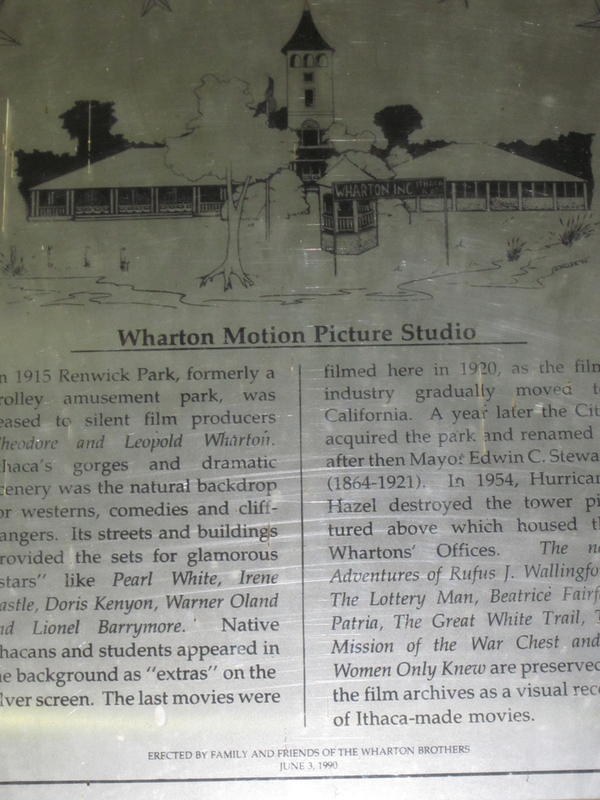 I had just arrived at the park to be sure the cake and flowers had been delivered and to check on the set-up progress. As the winds raged, the catering staff dashed around tightly bolting the french doors. Lightning was followed by a brief burst of hail; walls of rain slammed against the windows. Realizing the girls would be leaving the salon where I had left them in the final stages of preparation I had a brief moment of panic. I called my younger daughter’s phone. She answered and assured me they were all safe and dry, sitting out the storm in their car and waiting to get some lunch. Yes, she said everyone’s hair was still nicely set. Twenty minutes later the heaviest of winds passed, leaving behind ever weakening bands of rain which lasted a few more hours. 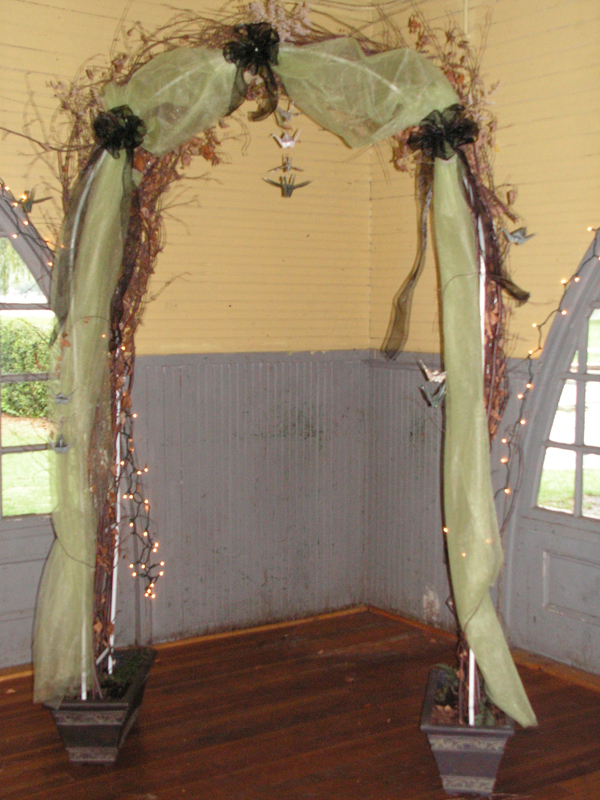 The birch branch arbor, made by Joe’s dad, remained safely inside the pavillion. The rain tapered off to a drizzle. Phone calls, text messages lit up my phone as people began to arrive at the park. Hold tight, I said repeatedly, yes everything will be all right. I took my daughter, already on the verge of tears all day even without weather concerns, aside and we discussed how to make the decision of indoors or lakeside for the ceremony. 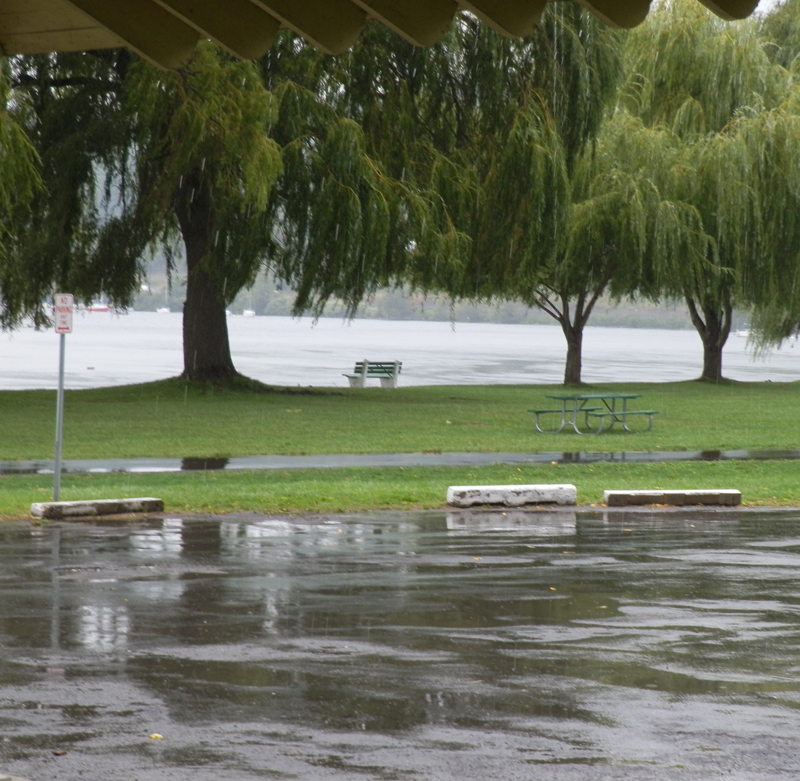 She and Joe had their hearts set on an outdoor wedding, the ceremony was short no more than 15 or 20 minutes in all, we had a perfect spot between two willow trees right by the lake, yes it was drizzling, I said the rain would stop shortly, how could I be so sure? I was following the NOAA weather reports, the sun was due to break through within the hour. 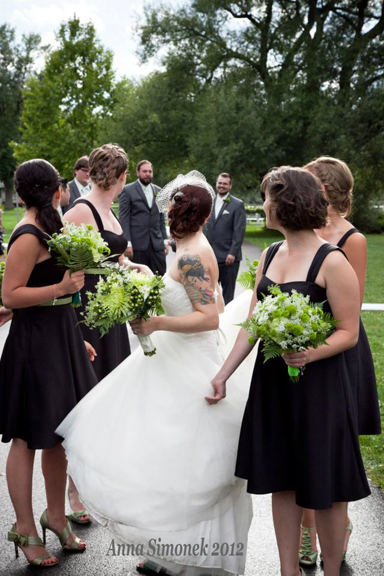 I sent the rest of the girls in the bridal party ahead; they called to report the pathways were damp, the ground a bit spongy but all walkable. Minutes before ceremony time, I made the call. 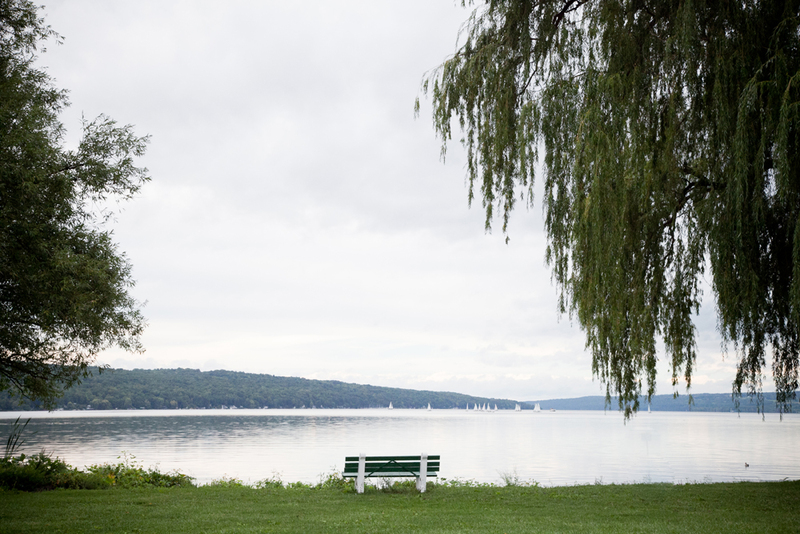 Put down the runners, move the arbor, we’re going lakeside. …as well as a spectacular sunset, another after effect of the storm. At one point the head caterer and DJ asked me how I had remained so calm in the face of dire weather. They were both in the pavilion with me when the storm hit. “Well, the weather was beyond our control. We had to just wait and see. 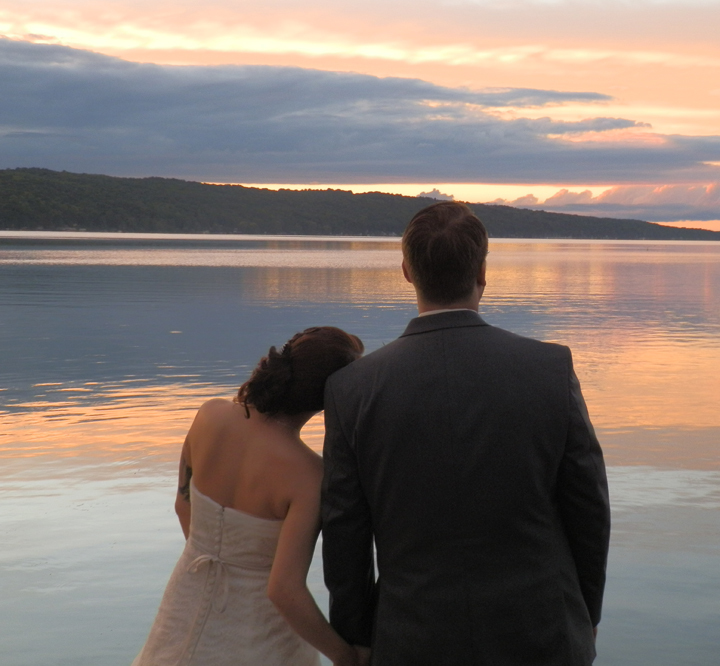 So when the bridal party called to tell me the boats were out on the lake, I knew everything would be all right.” Thus, the reason the photo is my favorite from the wedding. As I compose this post, a year and a half later, Kara and Joe are driving across country with their sweet rescue dog Coffee, stopping to see selected sights on their way to a new life together in Portland, Oregon. Her sister is traveling with the high school orchestra on a week long trip to the Disney World Music Festival, where they will play in the parks and compete with groups from many locations. As my daughters grow into their own lives and I feel the tell tale tug at my heartstrings, I often look at the large print I have of that lake view photo. Everything will be all right. 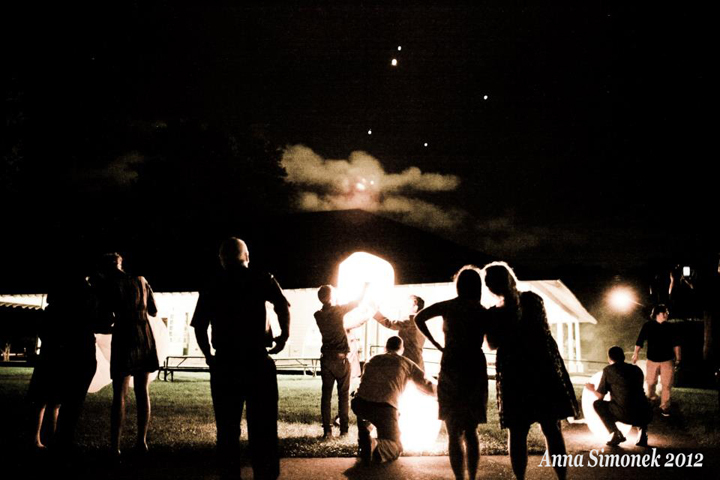 The final moment of the wedding, as Joe and Kara, the bridal party and guests release sky lanterns.